The perfectly calibrated stainless steel clamps fit universally on all Weck jars. These are of the highest quality and contain NO BPA! 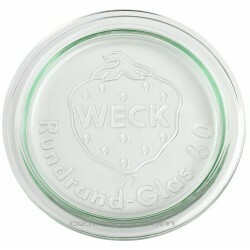 (Bisphenol A) Weck glass jar lids are the only preserving lids in the world that can be reused thousands of times! Suitable for water bath, and pressure canning! With the added bonus of being able to freeze and bake! (Baking in the jar is not possible with Ball Mason or Fowlers Vacola) The most versatile and beautiful preserving jar available today! Like all canning jars, the rubber rings and glass lids of Weck jars need to be perfectly tear- and chip-free for the seal to become airtight. And like everything else in the world, the clamps for the jars can be misplaced. Clamps fit all Weck jars and are sold in packs of 12. 3 or 4 per jar. Please note that Weck clamps will not work on Fowlers Vacola jars. 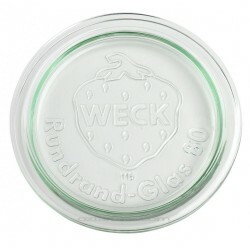 It is easy to tell when Weck jars are successfully sealed. Canning jars seal after being taken out of the boiling water bath as they are cooling on the counter top. The changing temperature creates the vaccuum seals. If the jar is sealed, the tab on the rubber ring will be pointing down. Allow the jars to cool fully (preferably for 24 hours) before removing the clamps. Check again that the jar is sealed by lifting the lid. If it is sealed the lid will not lift off. If the lid comes of, either reprocess the jar, or put it in the refrigerator and seat the contents in a reasonable time period. Mini straight, mini round, bottle and cylinder jars take small replacement rings and lids. All other straight and round jars take large replacement rings and lids. Ozfarmer Australia pleased to announce that we are now the Australian Distributor for the world famous Weck preserving jar. Weck Jars are known throughout the world as the best preserving jars on the market manufactured in Germany with the highest quality and German precision! These are also known as heirloom jars in Europe because they are so well made they tend to last forever.